Another week has flown by ~wow crazy. The challenge for this week at Whimsy is White on White. I wasn't to sure how this card would turn out just because once again something new, that threw me out of my comfort zone. It's not a bad thing really just something I have never done before. I typically like lots of layers and color to match and make things pop out. 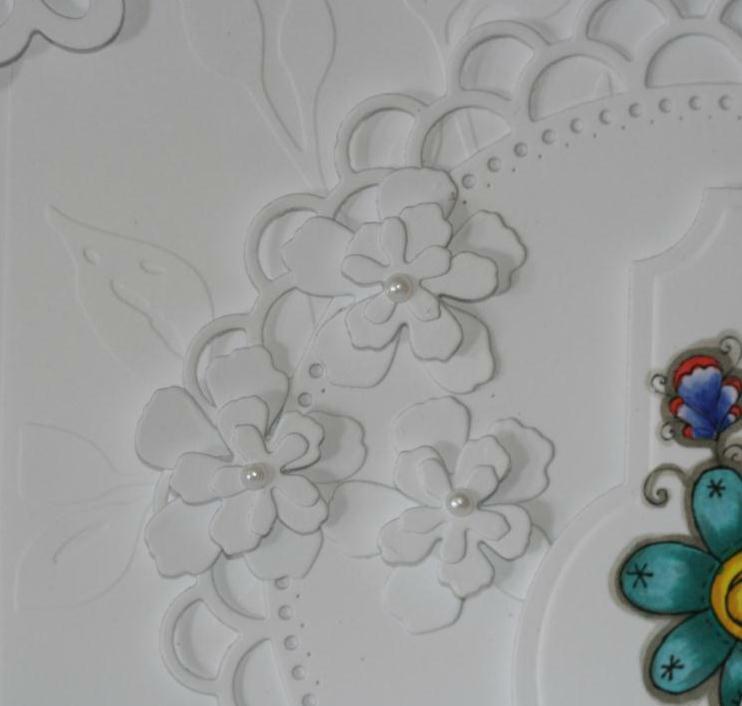 If I do add a lot of white on a card I really add alot of distressing on the edges of the cut pieces, to give alot of dimension. Not for this challenge though it is kind of like monochromatic but with white. I am actually really happy with my card, it turned out really nice. So have all the Whimsy DT cards they are all beautiful, you should click here and check them out. There are alot of really fabulous ideas. 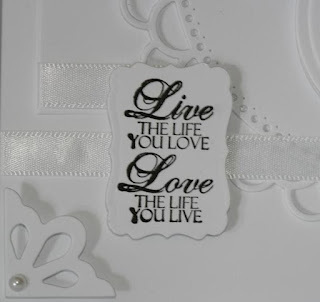 I am really hoping that this inspires you to maybe try to make a White on White card and add it to the Challenge this week. The image that I chose to used this week is from the Moon Cookie collection called "Romantic Bouquet". A great image- it's like giving a bouquet of flowers to someone, they are wonderful images to work with. You should check them out at the Whimsy Stamps Store. These flowers are cut from a Memory Box die cut, I foam squared in between the bottom and second flowers to give it dimension. The scallop circle is a die cut from Whimsy its called a Double Scallop Doily Die - I just got it in the mail and couldn't wait to use it. This is a cute little stamp that I got in my Whimsy order that I received recently.This picture also shows the cut corner dies from Whimsy Stamps. It comes with 4 corner dies. 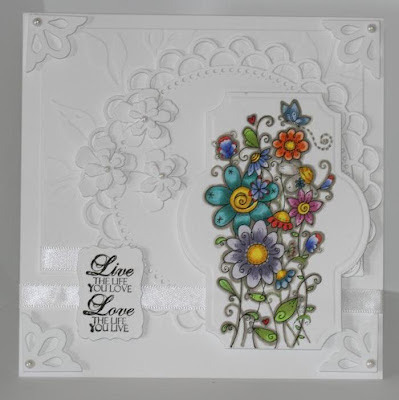 Supplies: Whimsy Stamps digital image Romantic Bouquet, corner die set, Double Scallop Doily Die, Copic Markers, Spellbinder Labels Twenty-Two & Labels Seventeen, Provo craft Cuttlebug folder Leafy Branch, Kaiser Craft Snow Pearls, Bazzill cardstock, ribbon. Way to go my friend, love that image, so pretty, reminds me of my flowers I got yesterday. 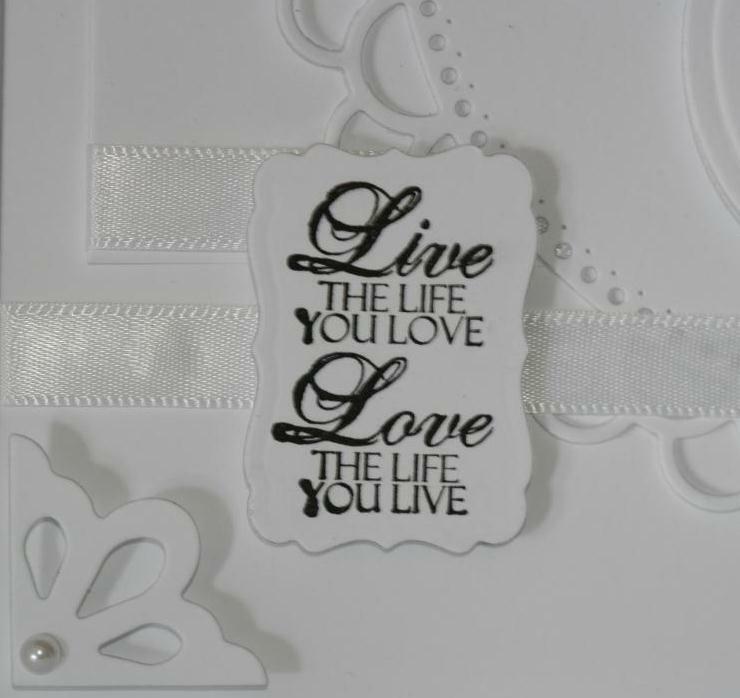 Love it, and white on white, nice touch, with all that texture...AWWWWWWesome! WTG! Really pretty card Charlene. Love the way your image pops on the white. There's an award for you posted on my blog. p.s. Gorgeous new card!So pretty!